Ridgidrain soakaways feature perforated pipes laid horizontally along verges, in fields or vertically down boreholes to receive rainwater collected from the roof, road or car parking area. Properly designed Ridgidrain soakaways incorporating suitable catchpits, require no maintenance other than the removal of silt and leaves from the catchpit, which may be done easily by on site maintenance staff. 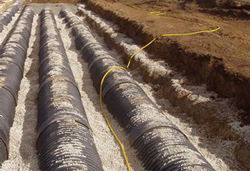 Where the ground is suitable, permeable Ridgidrain pipes are installed in the same tried and tested way as conventional flexible pipe systems and are suitable for installation under all loading conditions. Under some soil conditions a permeable geotextile wrapped around the pipe may be advisable to prevent silt migration.